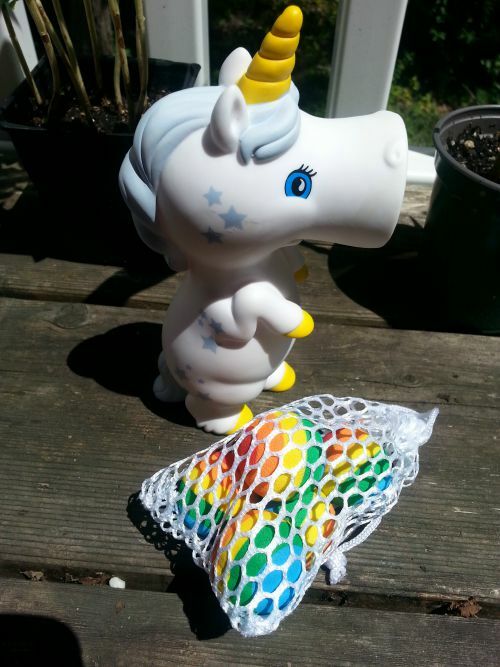 Hog Wild is a toy and gift company that makes these adorable poppers. 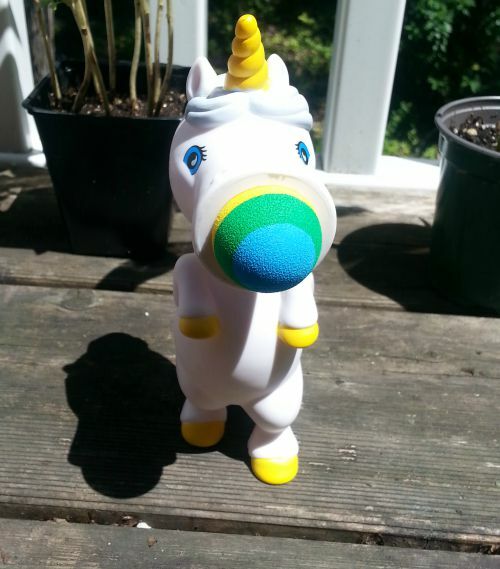 This Unicorn Popper is a squeezable soft foam shooter. It comes with 6 small foam balls that are rainbow colored. This toy is safe for indoor use. If you squeeze it hard, the balls will shoot further. 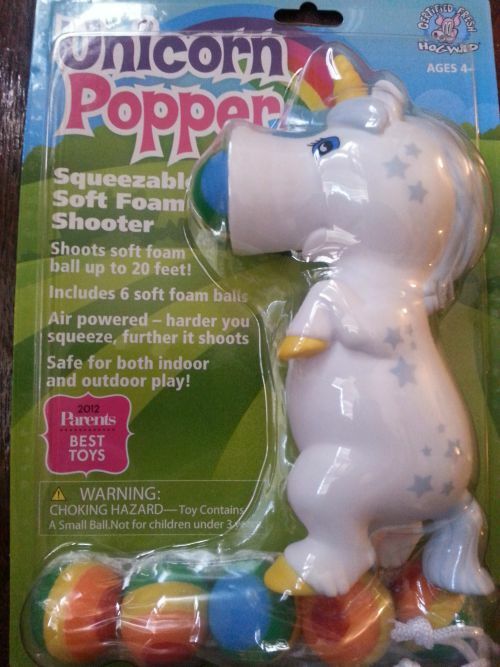 When we first got the popper, my daughter would not let it out of her hand. She walked all around the apartment with this cute unicorn. 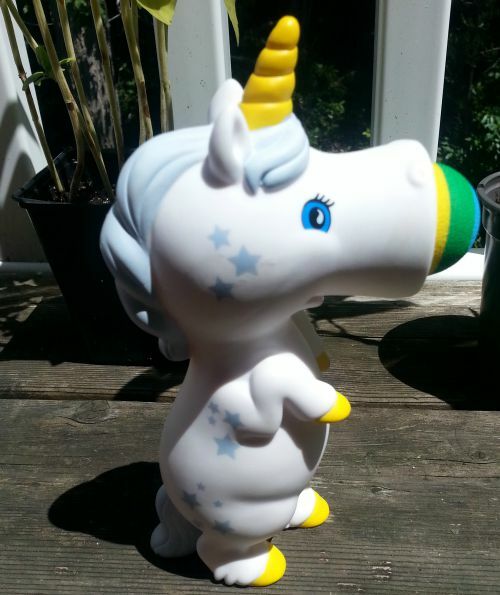 The popper we got is called White Sunshine. There are a ton of different poppers you can choose from. They even have soft and squeezable plush poppers. How cool is that? Check out all the poppers here. Here he is in all his glory. Okay, I keep calling this popper a "he" and my son says no it's a "she". I think it's perfect that we got a fantasy creature, because as a family we love that kind of stuff. You just squeeze the belly area/the sides and the ball pops out. And it makes a fun pop sound. The foam balls are safe and do not hurt. They also make key chain poppers which I think would make great stocking stuffers or easter basket fillers. Overall, I would definitely buy these as gifts for my kids and for others. They make so many fun toys besides the poppers. This is so cool, I want one of these. I would have so much fun popping the ball lolzzz... Thanks for sharing. This is so cute and we would totally play with this in our pool. You should do video unboxing like that woman does on YouTube! !